Grand Cru red Burgundy from the Louis Latour estate vineyards. 100% Pinot Noir. This particular wine is only produced in years when the Pinot Noir grapes reach perfect maturity. The wine derives from the following holdings: Les Bressandes, Les Chaumes, Les Pougets, Les Perrires and Les Grves, all of which are planted with vines with an average age of over 40 years. 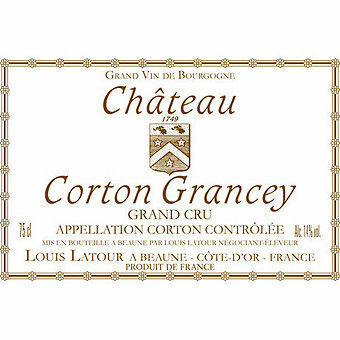 After about 18 months of aging, each cask is then meticulously tasted and only the finest ones, showing the best color, bouquet and capacity to age, will be blended to make Chteau Corton-Grancey. Wine Enthusiast Magazine scored this 2014 95 points saying "This is a blend from several Grand Crus on the Corton hill. It is rich and spicy, with great black fruits and solid tannins. A powerful wine, it's shot through with acidity and black-plum fruits throughout the structure. Drink from 2023."